Storm Ophelia - a tropical storm - brough with it a red sub and eerie yellow light and a weird smell of burning in the south west, though to be from ash blown in from wildfires in Portugal. 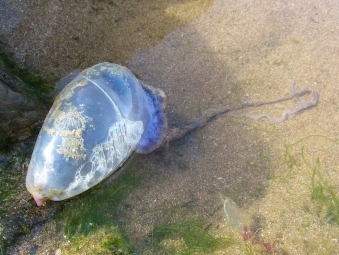 It has also brought a third wave of portuguese men of war with reports of hundreds washed up in north Cornwall. The above photo was taken by Teresa James. More about Portuguese Men 'O War here. 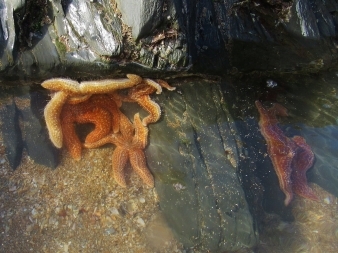 There are reports of starfish being found in unusually large numbers in the South West. Some are washing up and some have been not so lucky. There seems to be an army of beacj walkers who are picking the live guys up and popping them into rock pools. Have a look at our new guide to starfish. UPDATE: A theory has come to our attention which might explain the phenomenon - strfosh have been observed 'starballing' ie. rolling alon th seabed with their arms in a sheroid shape in rough seas. 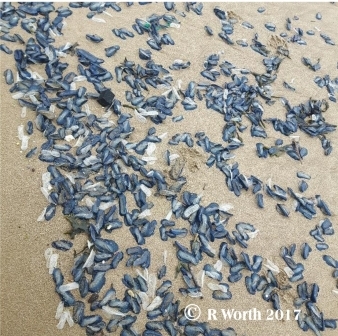 The theory is that this may be a deliberate act on their part to enable them to spread their larva around but it may sometimes go wrong and lead to mass strandings. 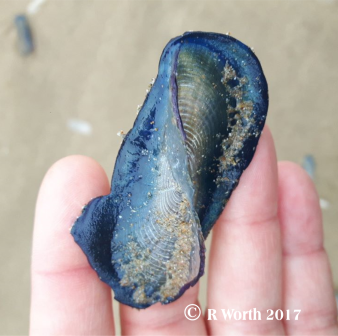 The last few days have seen another 'wave' of Portuguese Men 'o War coming in with sightings in Dorset, Cornwall (where there have been hundreds washed up on the north coast), Weston Super Mare, Wales and North Devon. Garry McPhail found what he suspected was ambergis - he noticed the telltale squid beaks embedded in it - and has now had it tested. 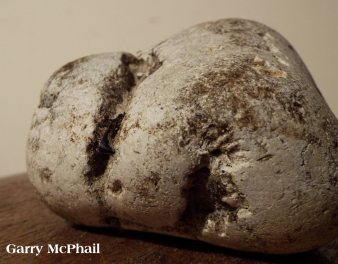 It really is ambergris! 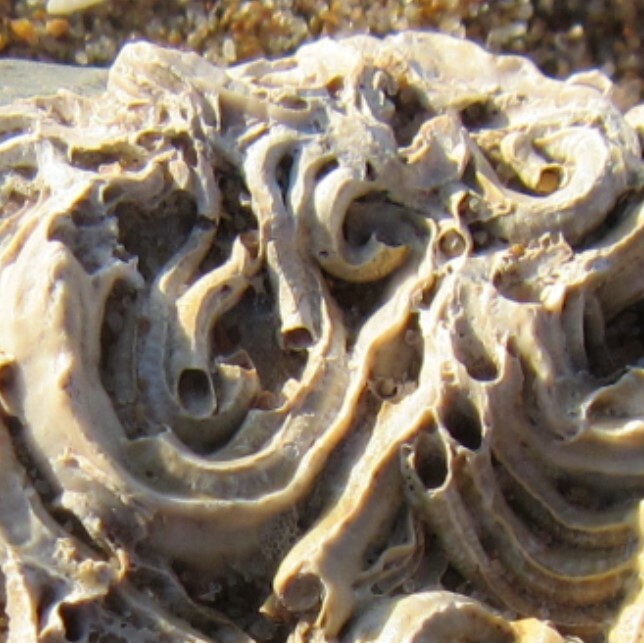 Potentially worth around £800 for a kilogram, that's a lucrative bit of beachcombing! 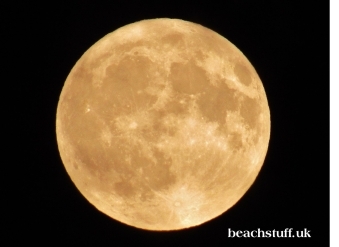 The Harvest Moon is the annual full moon which is closest to the Autumn equinox (22nd September this year) but this is actually the first one we've had since 2009. Harvest Moons look bigger and more colourful than usual full moons because of the tilt of the moon's path around the Earth. 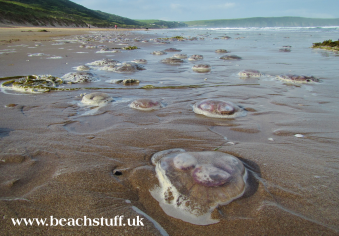 There are reports of Portuguese Men 'O War being washed up on the north coasts of Devon and Cornwall. 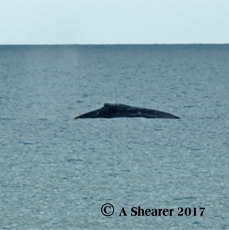 it is thought that it is perhaps the hurricanes going on in the Atlantic which are sending these unusual visitors in our direction. Their sting is incredibly painful and potentially damaging so keep a safe distance. More on these exotic creatures. 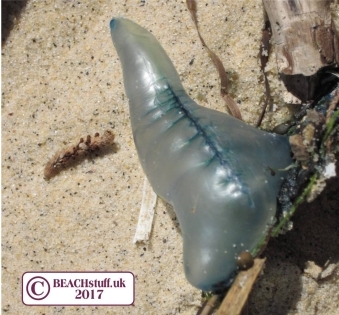 There have also been other unexpected findings on our beaches, probably as a result of the combination of the hurricanes in the Atlantic and our own storms. 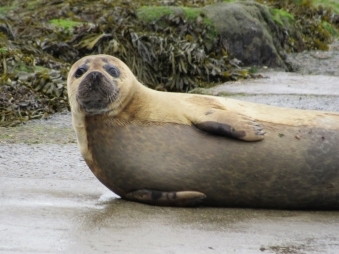 Amanda Baldwin came upon the macabre sight in Putsborough, North Devon, of a dead stag with no hind legs, a dead seal and the remains of a leatherback turtle. There have been a number of other sightings of washed up dead leathback turtles in the South West of England and southern Wales. With bad weather on the way, we've launched BeachSafe - advice and important phone numbers to keep you and yours safe on or near the beach. Bongo the seal, a seal that was rescued sa a lost pup and released earlier this year, has made her home on the slipway in Lee, North Devon. Sadly, she is a little over friendly and not only chases around families in search of snacks, but has also taken to following passing cars. UPDATE: For her own safety, she has been moved to a more secluded location. If you see a seal in trouble, here's what to do. 'Eel give you a surprise! 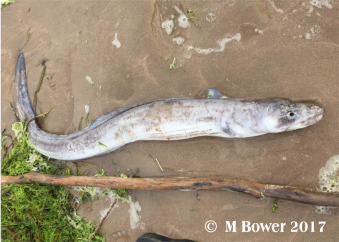 A conger eel was found washed up on Woolacombe Beach in North Devon measuuring perhaps up to a metre. These eels are common in the waters of the west coast but are stiull a bit of a shock when they are found stretched out on a beach! More on the eel here. 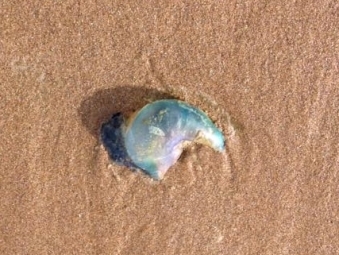 Jellyfish in their hundreds and thousands are being reported washed up on our Welsh and South West English coast beaches. 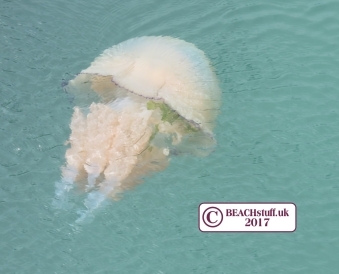 These largely clear jellyfish with visible pink rings are Moon Jellyfish, also called Common Jellyfish. 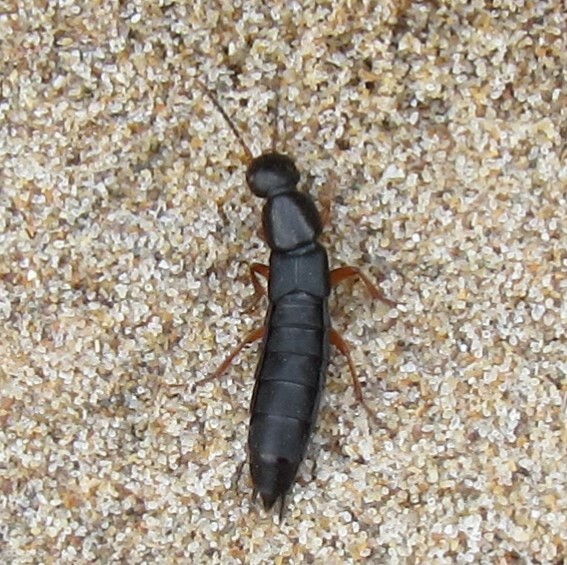 They are not known to be stingers - the main danger they pose is making some of the beach incredibly slippery! 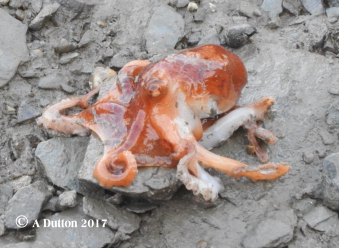 This large octopus was found washed up in a harbour at low tide. 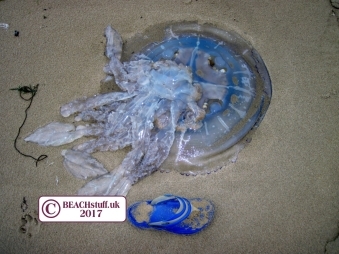 These barrel jellyfish can grow pretty big (that's an adult's flip flop in the first photo) and currently, there are lots of reports of them out at sea or being washed up onto beaches. Despite their size, they have a very weak sting and so pose little danger to us. 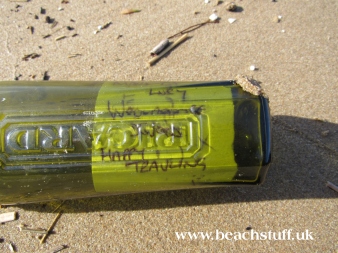 This bottle was found on Woolacombe Beach. How far had it travelled? How long had it been at sea? The message inside revealed all. 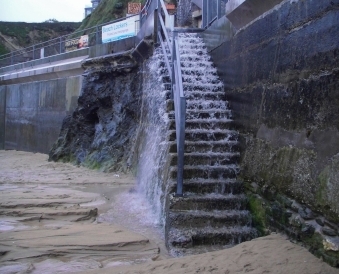 Rebecca, from Woolacombe, got in touch this morning to say that two lots of weird things have washed dup on Wooalcombe Beach. The first unusual sight was these thousands of By-the-wind sailors. More on these can be found at this page. Even weirder though, were these little plastic bottles which a quick Google search of the name on them, Gloxi, suggests is a brand of drink advertised as a 'height-enhancer'. Rebecca picked up a large number of these bottles. Sadly, these mass strandings of by-the-wind sailors are not uncommon as they cannot swim and are at the mercy of the wind and the currents. 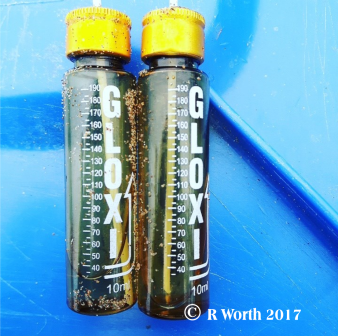 However, I have never seen bottles like these Gloxi ones on the the beach and it is a mystery how so many ended up there. 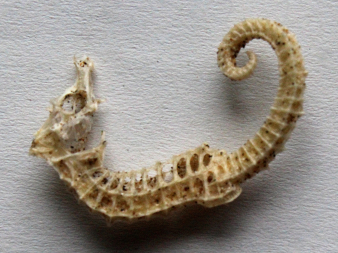 This seahorse has been found at Crow Point in North Devon. More about this rare find here. 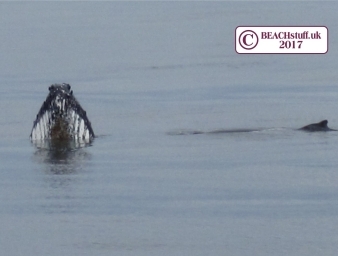 A humpback whale has been spotted very close to shore at Slapton in South Devon. More on this story here. Any finds you'd like to share?